We’re accustomed to thinking of things like cavities and accidents when we think about tooth damage... but it might surprise you to know that the most common sources of injury come from our own habits and hobbies! The two most common ways people injure their teeth and jaws are from sports injuries and bruxism (also known as teeth grinding). These activities put people at risk for damage like cracked or broken teeth and jaws, loose fillings, and jaw pain. If you play sports, a sports guard is a smart investment. Made of flexible plastic and custom made to fit your mouth, the guard absorbs the force of any sharp blow to the mouth or jaw, preventing injury. For people who grind their teeth, bite appliances work in much the same way. The appliance prevents the teeth from grinding together, preventing damage from bruxism. 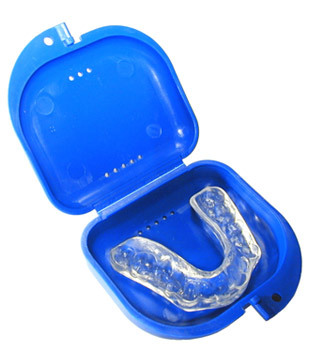 Custom sports guards and bite appliances are an effective way to prevent damage and injury to your teeth and jaw. Ask us about these important options at your next dental visit - your teeth are worth it!